I recently finished another kitchen remodel with B Gallant Homes. It ended up being one of my FAVOURITE projects because not only did it turn out amazing, but my client was one of the funniest, loveliest and entertaining people I’d ever met (other than myself, wink wink). When I first met Ellie and her 4 lovely pooches she showed me around the closed layout main floor. The kitchen, dining room, entryway and living room were all divided from each other by walls – lots and lots of walls. We took all of the walls down in between the living room, entryway, dining room and living room to create a gorgeous open layout floor plan. 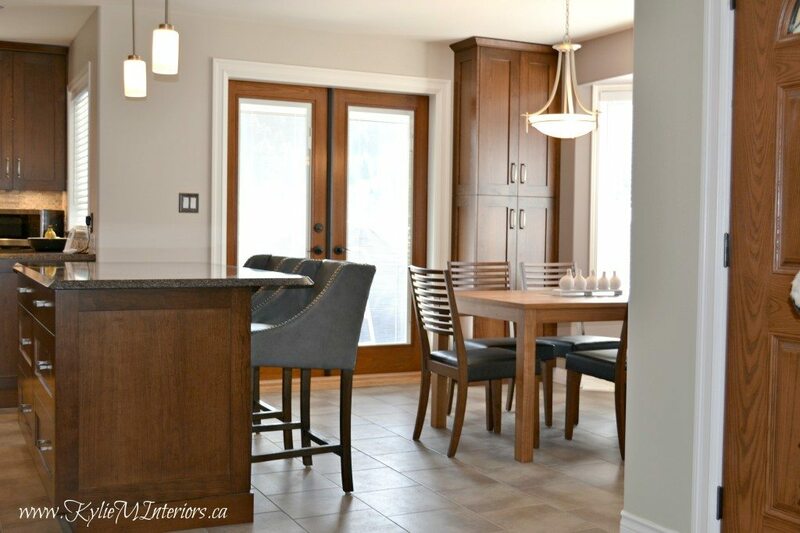 If you look at the French door in the before photo, then go to the after photo and look at the dining table, you’ll be looking at the same spot – it’s like magic! The island is placed where a wall used to separate the kitchen and dining room. Before: The layout was barely functional and not very attractive to look at. After: We repositioned the fridge, stove and moved the sink in front of the window for a better working triangle. We used Benjamin Moore Abalone and Sandlot Gray which are both grays with subtle purple undertones – I have mad love for these colours! These awesome bar stools were at Home Sense. They were bar stools – not counter height so OFF WITH THEIR LEGS And now they are juuuust right. Well, there you have it my friends – hope you enjoyed! Want some creative ideas for your own kitchen? 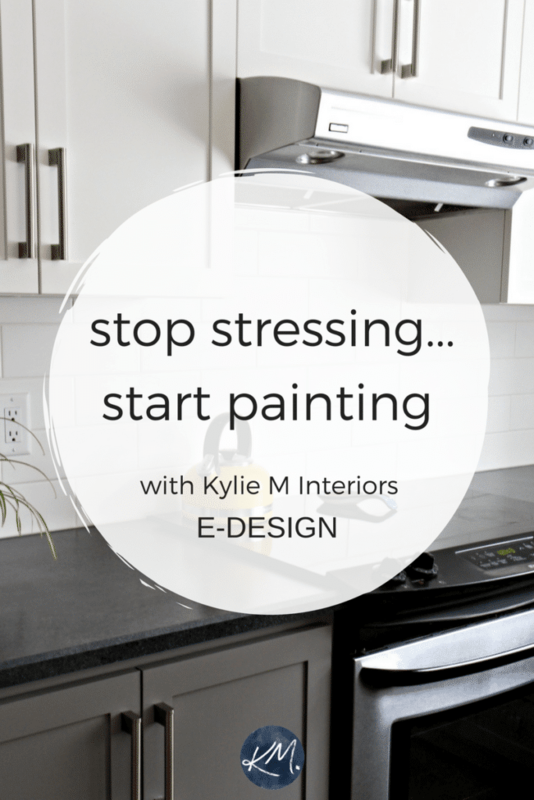 Check out my affordable and fun E-DESIGN and Online Colour Consulting Packages! Beautiful job, Kylie! When you said you’d sold your house I had great hopes that you were moving to Victoria. Alas, my hopes have been dashed! 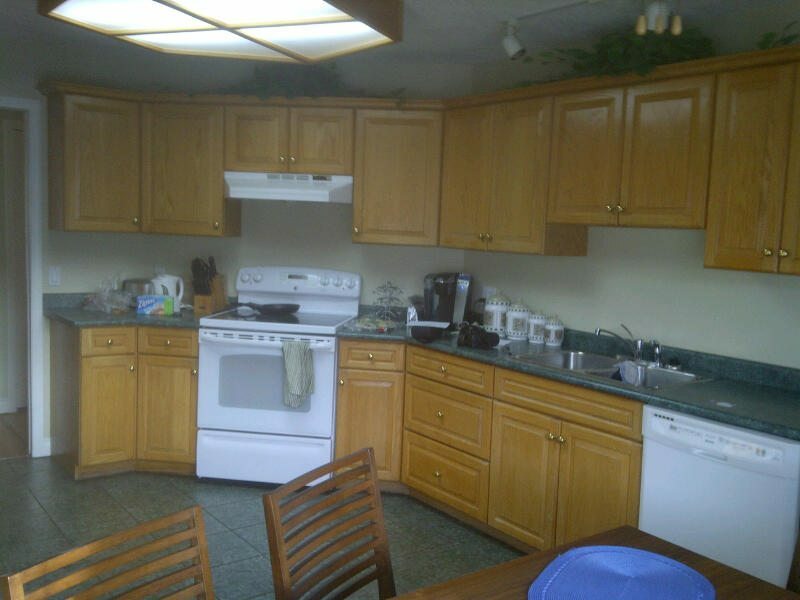 May I ask what cabinets these are? Where purchased? Hi Susan, I think this was Gillingham Cabinets, which I’m pretty sure isn’t around anymore!